Congratulations to team 80HD, the 2012 MassDiGI Game Challenge Grand Prize Winner! 80HD also won the Best Game Concept Category. Best Game Prototype Category Winner was team Commotion, Best Serious Game Prototype or Concept Category Winner was team USB and Wow! This Could Be Big! Category Winner was team Robot Dragon. Best Game Concept Category Runner-up was Part 12, Best Game Prototype Category Runner-up was Golden Hammer, Best Serious Game Prototype or Concept Category Runner-up was Urban Hero and Wow! This Could Be Big! Category Runner-up was Zephyr. Finalists included: 80HD, Commotion, USB, Robot Dragon, Part 12, Golden Hammer, Urban Hero, Zephyr, Red Survivor and Sketch-It. Honorable Mentions went to: Quark and Team Tetris. Winning prizes included a MassDiGI Summer Innovation Program game development team, Blackberry PlayBooks, MBBP legal services, honoraria and trophies. In total, 28 teams competed. Competitors included high school, college and university students, indie developers and technology professionals. Students representing institutions such as RIT, Northeastern, Becker, Tufts, Binghamton, MIT, Ringling, Bunker Hill Community College and Algonquin Regional High School were among the many competing or taking part. Over 300 people registered for the 2012 MassDiGI Game Challenge. The April 13-15 event was held at Microsoft’s New England Research & Development Center in Cambridge, MA. Thank you to all the 40+ mentors, judges, speakers and volunteers who made the 2012 MassDiGI Game Challenge such a success. Please visit our news page for links to stories about the event. MassDiGI is grateful to Microsoft, Blackberry – Research in Motion, PAX East, Turbine – WB Games, Becker College, MTC John Adams Innovation Institute, Muzzy Lane Software, Greenberg Traurig LLP, Morse Barnes-Brown Pendleton PC, Huminah Huminah Animation, Adyen, HitPoint, Pileated Pictures, HappyGiant Media, Great Eastern Technology, Vivox, Lycos, Gamesville, MassTLC and WGBH’s Innovation Hub for their support of the 2012 MassDiGI Game Challenge. Visit the Supporters page for more information on our sponsors. 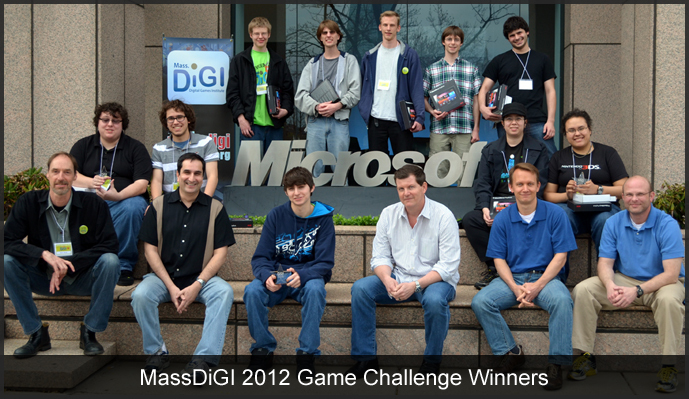 Download a copy of the 2012 MassDiGI Game Challenge program here. Get a head start on next year’s event and start getting your game together today! * Pictured above are the members of the 2012 MassDiGI Game Challenge Winners – (L-R) USB, 80HD, Robot Dragon and Commotion. Also pictured are judges and organizers from Muzzy Lane, MassDiGI, Pod Design and Microsoft.